Spanish watch enthusiasts virtual community. Includes forums, watch news and reviews, sales corner and community blogs. 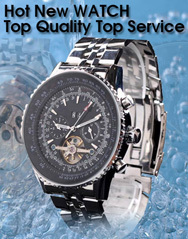 Watches, Horloges, Uhren, Orologi, Montres, Relojes. Perfect. The forum I most like. Una pagina excepcional, llena de buena técnica y buen hacer. Panerai Watch Source - Panerai Watch Information Resource with Model info, articles and Forums!